US stocks were sold-off yesterday and failed to hold intraday gains as the FOMC minutes caused some confusion. The SP500 index dropped 0.70% on Wednesday and was consolidating on Thursday, adding 0.15% to trade around 2,630 USD during the London session. The FOMC minutes showed that the Fed now twice used the word `symmetric’ to describe its inflation objective, emphasizing they view a persistent overshoot the same way that they view a persistent undershoot. This caused some confusion at first, but investors interpreted it in a hawkish way – if inflation rises further above the 2% goal, the Fed is ready to tighten monetary policy faster, ergo more (or bigger) rate hikes are coming. The greenback strengthened afterward and stocks dipped, with the SP 500 index dropping back toward the key 200 day moving average. Today, the main focus will be on the non-manufacturing ISM index, which is projected to decelerate slightly in April to 58.1 from 58.8 previously. 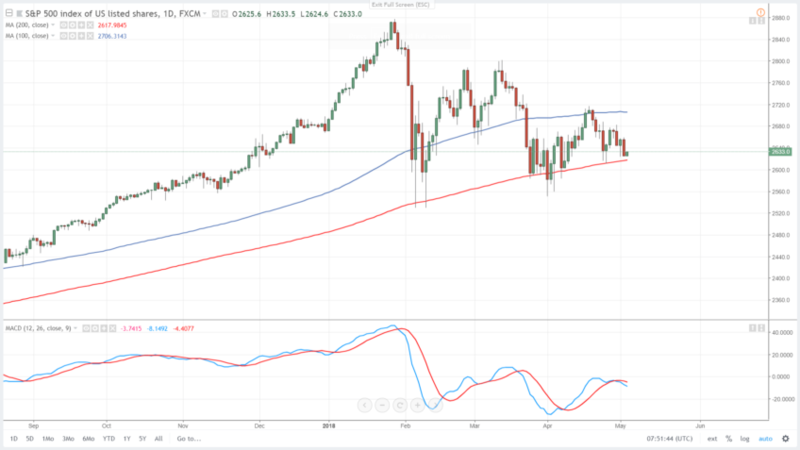 The SP500 index appears ready to test the 200 day moving average at 2,615 USD again, but every bounce from this key support has been weaker and weaker, suggesting a possible breakdown below this level. The next support would be at the 2,600 USD mark. On the other hand, the resistance for today’s trading is at yesterday’s highs near 2,655 USD. In all cases we strongly recommend to have rigorous money and risk management.